Pilsen is one of the many Chicago neighborhoods that shows the cultural diversity that this large Midwest city has to offer. Originally settled by German and Irish immigrants in the mid-1800s, the Pilsen Chicago neighborhood eventually became a haven for Czech immigrants, who started arriving in large numbers in the late 1800s. The name Pilsen actually comes from a Bohemian city in the Czech Republic, and buildings including St. Procopius Church and Thalia Hall serve as reminders of this neighborhood's Bohemian past. After the turn of the century, many Polish immigrants moved into the Chicago Pilsen neighborhood, and the St. Adalbert Church, which was built for the Polish community in 1914, is an example of that heritage. Its murals of a queen's wedding and a homeland battle involving invading Swedes are certainly worth checking out when in the area. Today, Pilsen Chicago, which is often mentioned in the same breath as the adjacent Little Village neighborhood, is mostly a Mexican-American area, though incoming investors are quickly looking to turn it into the West Side's newest residential hot spot; thus the makeup of the Chicago Pilsen neighborhood is likely to change in the near future. The neighborhood's eastern area has already been gentrified somewhat, and in addition to new apartments and condos, clubs and restaurants stand poised to spring up on the Pilsen streets. However, that doesn't mean that the largely Hispanic influence has waned all that much. Between Pilsen and Little Village Chicago, you will find the Latino spirit alive and well, and if you visit during the Pilsen Day of the Dead celebration or the Little Village 26th Street Mexican Independence Day Parade, you'll really get a taste of the local culture. The Pilsen and Little Village Chicago festivals are among the most colorful and artistic in the city, so you might plan your visit around one of them. During the Day of the Dead celebration in Pilsen, the community's artistic side is on display for eight weeks starting in September. Latin American art isn't the only thing spotlighted during this long-running celebration, as Pilsen boasts an increasingly diverse artists' colony, thanks to the availability of affordable loft space in recent years. The National Museum of Mexican Art, which is one of the top Pilsen and Little Village Chicago attractions, is the center of the Day of the Dead celebrations, and its annual Day of the Dead exhibition is a big reason why. As for the Little Village 26th Street Mexican Independence Day Parade, it takes place in mid-September. This lively procession features folk dancers, mariachi bands, and a fine array of floats. The largest Hispanic parade in the city, the Little Village 26th Street Mexican Independence Day Parade attracts thousands of visitors every year, which only adds to the excitement. For those interested in food, another festival that might be of interest is the Mole de Mayo, which is an annual cooking competition that takes place in early May. Admiring the older architecture, checking out the local art, including the Mexican wall murals on some of the local buildings, and enjoying a lively cultural celebration are among the top things to do in both Little Village and Pilsen Chicago. One of the other top things to do in these lower West Side neighborhoods is eat, thanks to the quality of the local taquerias and bakeries. Eighteenth Street in Pilsen is a good place to start if you're looking for some good food, and after you enjoy a rewarding meal, you might head over to 26th Street in Little Village to do some shopping. This street is the center of Mexican-related commerce in the area, and there are plenty of interesting and unique goods to browse through. The Chicago Pilsen neighborhood and the adjacent Little Village are easy to reach from the Loop, and many visitors choose to come on the train. 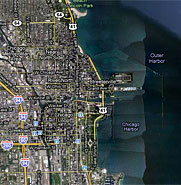 This relative proximity to the Loop has a lot to do with the area's growing population. Most of Pilsen is centered around Halsted Avenue and 18th Street, while 26th Street is the main thoroughfare in Little Village. If you're tight on time, these streets are what you will want to focus on during your Pilsen and Little Village Chicago visit. Should you have plenty of time to work with, you might head up to the nearby Little Italy neighborhood after you visit Pilsen and Little Village. A visit to Chicago's near West Side can certainly prove to be satisfying when you're looking to enjoy the local culture, and though the area is changing, it still maintains a lot of its heritage.